Which Low Voltage Lighting System Is Installed In Your Home? Have an older house with a low voltage wiring system? 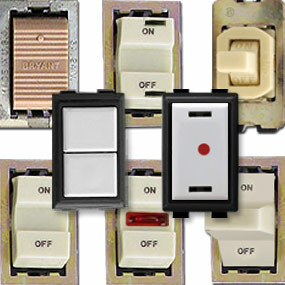 Kyle Switch Plates specializes in replacement parts for low voltage light systems. We stock odd switch plate configurations for older style low voltage rocker switches plus currently manufactured square or rectangular pushbutton electrical devices that are compatible with systems installed in houses built in the U.S. during the 1940's, 1950's, 1960's, 1970's and 1980's. Review the main systems here to determine your series then shop for replacement parts by brand: GE, Bryant, Touch-Plate, Sierra / Despard, or Remcon. IMPORTANT: The quickest and best way to identify your low voltage system brand is to locate the relays. Some brands have discontinued production of light switches, and as a result, some or all of the switches in your home may have been updated to a newer brand. The relays will indicate the correct brand of your system, and the system brand will affect which new parts you need to purchase when replacing broken relays, switches, etc. Use the images of switches below to get a feel for the type of system you have, but don't forget to locate your relays to verify your system's original brand. Relays may be located in the ceiling near the light fixture, or in a relay panel in a garage or attic. CLICK ON the image below that looks like your system to learn more about ordering proper replacement parts. Description: Rare, old-fashioned GE low voltage lighting systems have mini 24 volt 3 wire rocker switches, part numbers RFS-3, RFS-6 or RFS-9 that are mounted in narrow steel straps, also called brackets or yokes. The switches have a gap in the middle, one side says ON the other side says OFF. The switches rock from side to side. Many homes had these plates installed horizontally so the switches go up and down. The switch plates can have either 1, 2, 3, 4 or 6 switch openings that are .656" high by 1.092" wide and cover the strap mounted devices. Wiring system uses transformers and solenoid relays. 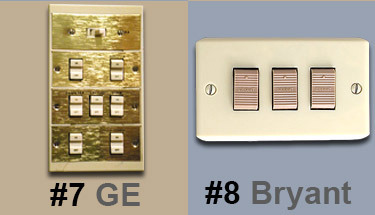 Replacement options: Kyle Switch Plates has the Original Style switch plates custom made since GE no longer makes them. Be sure to keep your mounting brackets, since they are no longer made. The old style switches have been updated to the RS2 series switches.These switches function the same and are a direct replacement. 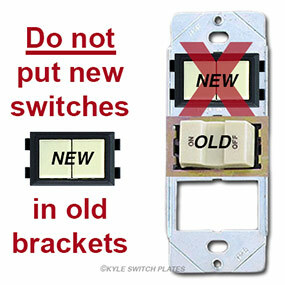 The new style switches are a little bit larger than the old style switches, so any location getting a new switch will need to get the New Style switch plates. 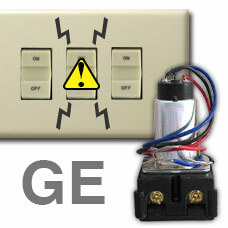 To buy parts, visit GE Low Voltage Lighting Systems Replacement Parts. Description - RS Series Snap-In Low Voltage Sizes: These are current parts available for purchase. General Electric low voltage lighting systems require switch plates that have a single vertical opening, or one, two or three horizontal openings that are .76" x 1.278". GE replacement switches snap or clip into the front of the switch plates. Choose this system if you are using new style GE RS series snap-in electrical devices without a strap and wish to mimic the format of the old style Bryant or General Electric wall plates and light switches. Original Style switches and straps (shown in image #1 "GE" above) are no longer manufactured. To buy current parts, visit GE RS Series Snap In Low Voltage Lighting Parts. 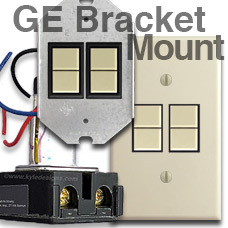 Description - GE Bracket Mount Low Voltage Sizes: General Electric's bracket-mounted low voltage lighting system features switch plates that have one to four vertical openings. 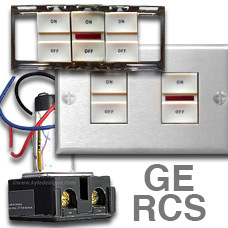 RS series switches are mounted in diamond shaped one- or two-gang brackets. Choose this series if you are using newer style General Electric RS series electrical devices clipped into a metal bracket mounted in an electrical box. Switch plates mount onto bracket, so they may be removed without disturbing or unwiring the switches. 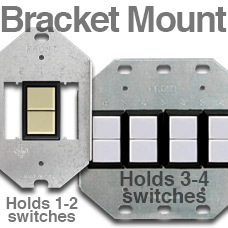 You can mount 1-4 switches in a single GE bracket mount plate. These multiple vertical openings are 1.178" high by .756" wide, spaced .906" apart, with device bracket mounting screw holes spaced 2.375" apart center to center. 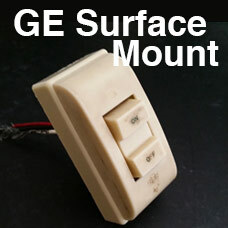 To buy parts, visit GE Bracket Mount Low Voltage System Parts. Description - GE RTS-5 Switches: These vintage switches have the basic shape of the common toggle switch, but with a couple of distinctions. The base of the switch can have either a strictly rectangular shape or one with round edges on two side (Despard shape). And because the switches are momentary contact, the switch returns to the center after flicking lights on or off. 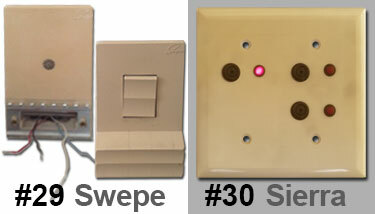 Older style of interchangeable toggle low voltage switch has been discontinued. One way to distinguish between momentary switches compared to regular toggle switches is whether the switch remains up or down or returns to the center position when you release it. 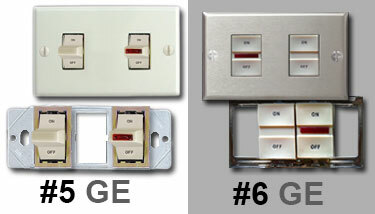 Update to GE's new look with modern low voltage switches and cover plates. Replace any broken model RTS-5 GE switches with the new GE switches and wallplates or with low voltage despard momentary switches which fit Despard switch plates. Description - GE Trigger Switch: As with most of these vintage light switches from GE, this style of light switch is no longer manufactured. 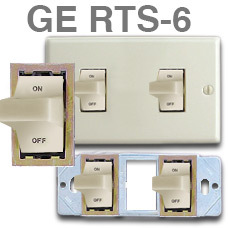 The most common update for these discontinued RTS-6 switches is GE's new style switches with coordinating covers. The new switches have 2 buttons and you'll press one side for ON and the other side for OFF. If you prefer the functionality of the old trigger style switches (that return to a centered position after being pressed one way or the other), you can also replace these old GE ones with despard low voltage momentary switches & despard covers. Description - RCS Spec Grade Sizes: General Electric RCS spec. grade low voltage plates have the largest openings in the older wiring systems that are .906" high by 1.25" wide for one, two or three devices. Note that the 3-switch opening is an open rectangle that is very similar in size and shape to current Decora style wall plate openings, but cannot be used interchangeably because they don't fit. These switch plates were designed for General Electric's large wide rocker switches and pilot lights know as their RCS series. (Pilot lights have a long lighted rectangular red bar in the middle that illuminates when the device is turned on.) This series was produced mainly in the 1970's. Kyle Switch Plates manufacturers the replacement stainless steel light switch plates for the discontinued RCS line of switches. These switch plates may also be used in some off-grid battery electrical set-ups typically used in boats & RV's. 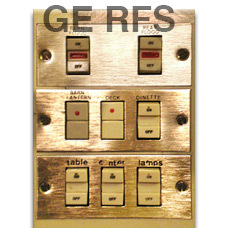 To buy replacement wall plates, visit GE Low Voltage RCS Switch Plates. 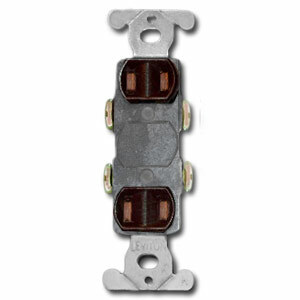 Kyle Switch Plates is the only manufacturer of replacement switch plates for GE's old RCS low voltage line. 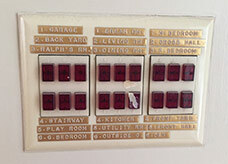 New individual plates can be purchased to cover these old style light switches from GE. They don't come with the metal overlay, but are available in ivory, white or stainless steel. Decorative overlays can be purchased separately. Find replacement cover options here. If the switches need to be replaced, update with new GE parts here. Note that new switches require new plates but no mounting bracket. For multiple gang switch plates in the General Electric Decorator series, we are working on a solution for replacing these switch plates. Description - Bryant Original Low Voltage Sizes: Bryant low voltage wiring systems were installed in older homes built in the 1950's and 1960's. These rare, old-fashioned style low voltage lighting systems have brown mini rocker switches with the word "BRYANT" on them mounted in narrow straps. The switch plates have openings that are .656" high by 1.092" wide. Bryant wiring systems are based on the same type of transformers and solenoid relays used in General Electric systems, so parts in this series are compatible with GE lighting systems. Note that original style Bryant straps (yokes) and devices are no longer manufactured. 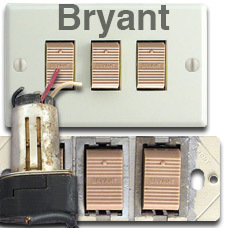 To buy parts, visit Bryant Low Voltage Lighting Systems Replacement Parts. Sierra Electric low voltage wiring systems use straps that are similar in look to other series'. The major difference is that the Sierra switches fit into switch plate openings that are rounded on the ends known as Despard switches. This is in contrast to typical low voltage series that have rectangular switchplate holes. Sierra Electric went out of business and was purchased by Pass & Seymour who continues to produce both low voltage 3A switches trigger switches and regular 15A and 20A Despard switches. Kyle Switch Plates carries Despard switch plates in a wide variety of metal finishes and configurations. 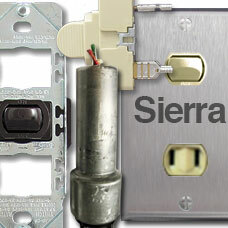 To buy parts, click Replacement Sierra Switches and Cover Plates. 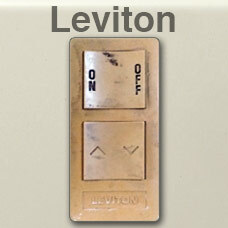 Some older homes have Despard outlet switches made by Leviton as pictured here. 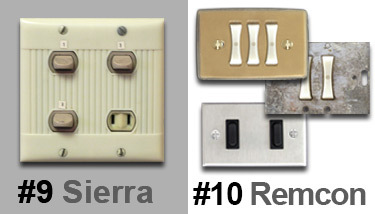 For these older outlets and switches you will find replacement parts by Sierra. If you have regular (not low voltage) Despard devices, you can buy replacement Despard switches and outlets and the matching Despard switch plates. 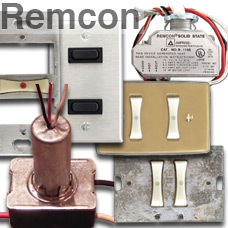 Description - Remcon Sizes: Very old Remcon lighting systems featured low voltage rocker switches that were curved, stacked and permanently mounted into brackets. Old style Remcon switchplates were typically installed horizontally with switches rocking up and down vertically to turn lights on and off. Devices were used in conjunction with box mounted transformers. Newer switches were small black rockers that snapped into stainless steel wallplates with openings that were .4375" high by 1.1875" wide for one, two or three devices. 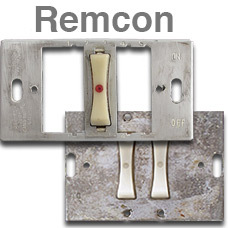 Original Remcon low voltage replacement switches and wall cover plates are no longer being manufactured, although Remcon's solid state relays with built-in transformers are still actively manufactured. If you need replacement devices or wall plate covers that will work with your Remcon wiring system, we recommend using Touch-Plate Light Switch Control Switches and Switch Plates. To buy relays, visit Remcon Low Voltage System Parts. 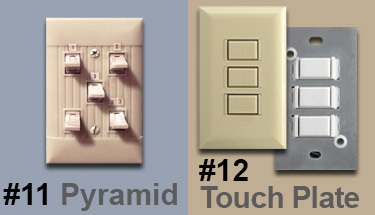 Pyramid switches and cover plates have been discontinued. 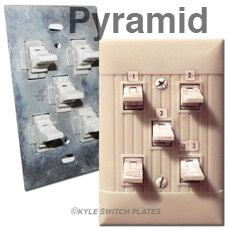 You are no longer able to purchase replacement Pyramid switches or switch plates like the ones pictured here. The picture is shown to help you identify your low voltage system. 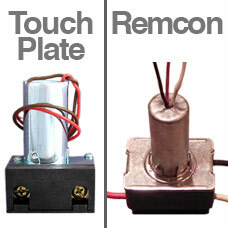 If you need replacement parts, Remcon relays and Touch Plate switches are compatible with your old Pyramid system. To learn how to order new parts, click Replacement Relays & Switches for Pyramid. Decsription - Touch Plate 5000 Series Low Voltage Systems: The Touch-Plates 5000 series looks very similar to the GE & Bryant series of wall plates that have 1, 2 or 3 switches per gang. The difference is that the switches are slightly wider and are spaced closer together than on the GE or Bryant layouts. A standard one gang switch plate measures 4-1/2 H x 2-3/4" W (4.5" tall by 2.75" across) with one, two, or three stacked horizontal switches that are 5/8" high x 1-1/8" wide (0.625" H x 1.125" W) mounted on a bracket with a separate switch plate cover. Openings are spaced 2-9/32" from top edge of upper switch to the bottom edge of lowest switch on two and three button switch covers. Box mounting screw holes in the brackets are spaced 3-9/32" (3.281") apart center to center. 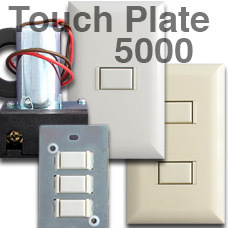 Touch-Plate Electro-Systems lighting control systems were installed in the 1940's, 1950's, 1960's, 1970's and 1980's. To learn more or to buy parts, visit Touchplate Low Voltage System Parts. 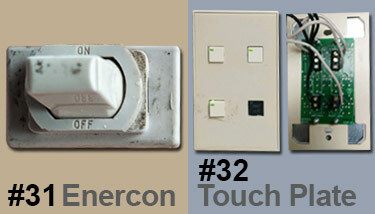 Touch Plate switches are the only replacement for another low voltage brand: Remcon. You may have Touch Plate switches that are wired to Remcon relays, in which case, you need to replace any broken relays with Remcon brand, not Touch Plate. Before ordering new relays or light switches, check which brand your relays are. The type of relay you have (Remcon vs Touch Plate) will determine which Touch Plate switches are the correct ones for your system. Read more about Remcon Low Voltage System Replacements here. 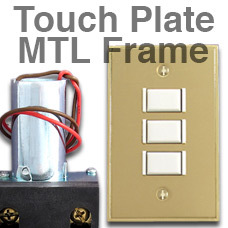 Touchplate's Frame Series may be replaced with any of the current Touch-Plate control stations. Read this important note regarding relay brand here (Touch Plate vs. Remcon in Section #12 above). Description - Touch Plate Genesis Low Voltage Sizes: The Genesis series has larger buttons and features industrial quality mechanisms. A standard two gang switch plate measures 4.5" high x 4.5" wide. The two gang wall plates have switches that are 27/32" (.844") across by 1-23/32" (1.719") tall and spaced 1-13/16" apart on the 2 button wall plates and 1-1/4" apart on the 3 button wall plates (center to center). Box mounting screw holes in wallplate are spaced 3-9/32" (3.281") apart center to center. The switches are screwed into the back of the wall plate. Touch-Plate Electro-Systems lighting control systems were installed in the 1940's, 1950's, 1960's, 1970's and 1980's. Be sure you have Touch Plate relays (and not Remcon) before purchasing replacement any borken relays - learn more here. 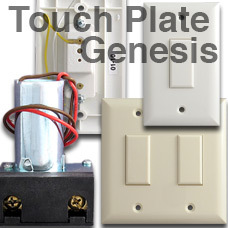 To learn more or to buy parts, visit Touchplate Genesis Low Voltage System Parts. 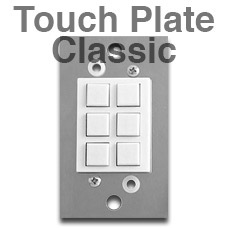 Description - Touch-Plate Classic Sizes: The Classic series features control stations with 1/2" square button caps in arrangements of 4 or 6 switches per gang (8 or 12 buttons on double gang switch plates) that will control an equal number of lights. Switches are mounted on a bracket with a separate plastic screwless switch plate cover that snaps over it. Touch-Plate Electro-Systems lighting control systems were installed in the 40's, 50's, 60's, 70's and 80's. 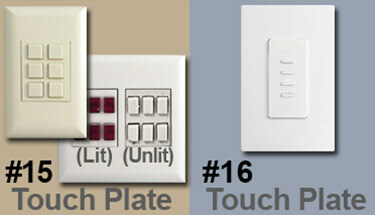 These updated modern systems by Touch Plate Lighting Controls are still installed today. 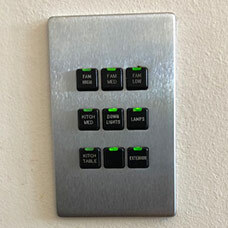 If you have these older style lighted Touch Plate Classic switches, you can update to the modern LED Classics, which have a small green LED light next each button (shown in image above). 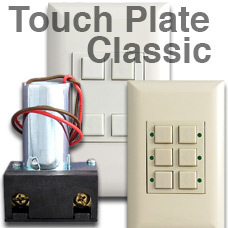 To learn more or to buy parts, visit Touchplate Classic Low Voltage System Parts. Verify your system is wired with Touch Plate brand relays (and mot Pyramid or Remocn) - learn more about relay replacement here. Description - Touch-Plate Ultra Sizes: The Ultra line by Touch Plate is the most modern looking low voltage system for homes. This is a 2-wire system with momentary contact switches. Screwless plates give a nice clean look. 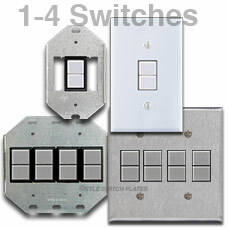 Or, you can buy just the switches and pair them with rocker plates in up to 17 finishes. 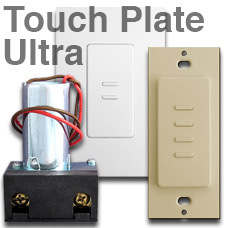 To buy Ultra line parts, visit Touchplate Ultra System. Before replacing a broken relay, check the brand (it may be Touch Plate or it may be Remcon) - learn more here. 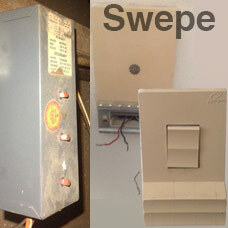 Certain old GE switches aren't mounted in a strap with a cover plate (as shown in example #1 at top) . If you have a surface mount low voltage GE switch like the one shown here, your solution is to buy a GE new switch with cover plate and a box extender. The box extender will allow you to mount your new switch on the surface of your wall. 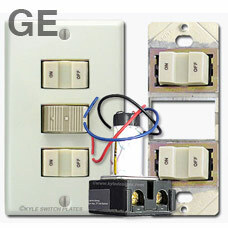 Buy Replacements: Buy a surface mount GE switch kit here. Shown: 3 surface mounted vintage GE switches on wall without cover. 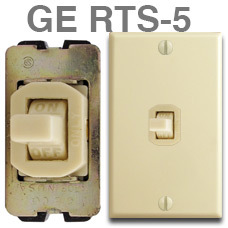 These buff finish RSS-1 GE switches had bulky ivory covers like the one shown above. 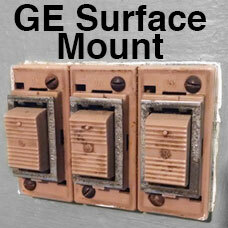 Buy Replacements: Buy a triple new GE surface mount kit or a double switch GE surface mount kit. 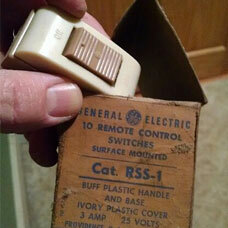 GE RSS-1 switch in buff with ivory cover shown with original box. The GE RMS-2A lighting control station is no longer manufactured. The recommended replacement is the 8 switch GE remote control low voltage master selector panel or Low Voltage 8 Switch Wall Plate Covers for GE Switches. The new 8-switch panel options would require combining two switches to reduce the controls to only eight. 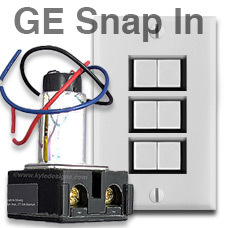 Another option - the 12 Switch Panel for GE Switches - would allow the addition of three more lighting controls (or the unused openings could be filled with blank inserts). If you simply need a new cover for your switch and dial, get a new GE RMS-2A cover here. You can also get 4 new GE switches and mount them in a 4-Switch Snap-In Cover Plate to replace your old controller & selector knob. 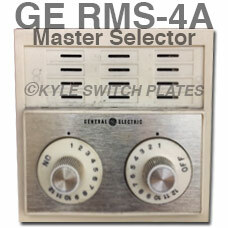 This RMS-4A Low Voltage GE Master Selector is no longer manufactured. (Photo below courtesy Gretchen Steinberg). The closest current replacement is the GE remote control low voltage master selector panel which only has 8 switches (switches would have to be combined if using this unit) but offers the ability to lock the switches in the on or off position. Kyle Switch Plates has an exclusive 12-switch replacement wall plate: New Style Snap In GE Low Voltage 12 Switch Wall Plate Covers. Another example of the vintage lighting contrl with 2 dials for a GE system. 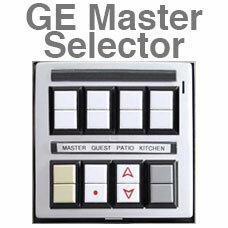 This part is your only option for replacing the an old GE controller or master selector panel. New master selector switches can fill up to 8 slots in the updated plate. 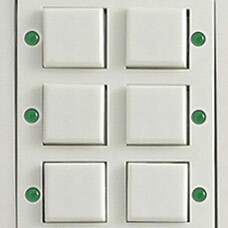 Any unused openings can be filled with dummy switches. Note that the switches and the panel itself are sold separately. For a cheaper replacement, get 8 GE Switches (same as required to fill the panel shown), but cover with an 8-switch cover plate instead of the bulkier selector panel. 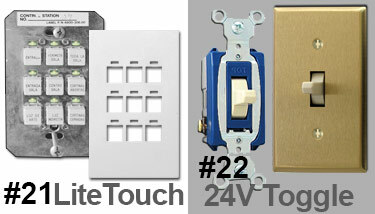 LiteTouch low voltage lighting systems feature switches with 1-9 buttons on a single plate, typically with engraved button caps identifying each switch. Older versions had separate green light bars just above each button like those shown, while newer versions have buttons with integral lights on the top edge of each button. While Lite Touch was produced for decades, this brand was bought out by Savant. Unfortunately, Savant discontinued the system in September of 2015 and has no spare parts and no upgrade options at this point. Because LiteTouch / Savant systems use a special protocol that is not compatible with the other low voltage systems above, your only option at this point is to replace the whole system. Lutron and Touch-Plate offer upgraded systems that would allow you to continue to use your home's wiring, but would require new panels, relays, light switches, and other adaptations. Click to learn how to upgrade your LiteTouch system to Touch Plate. Touch Plate LED's as a replacement for Lite Touch have been found to work. Note that when wiring them you'll need to determine which LiteTouch wire is the LED & which is the switch. You may find that they are wired the opposite way (i.e. instead of across, they may connect vertically). 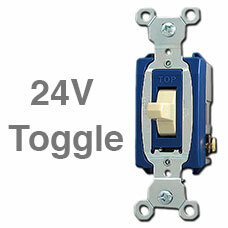 Replacement low voltage toggle switches are 24V, 3 amp momentary toggle light switches. Made by Pass & Seymour and available in white, ivory and brown. 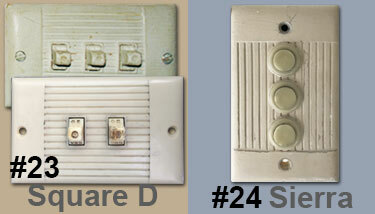 These 24V switches were manufactured by Square D Company, which was acquired by Schneider Electric in 1991. It appears these old low voltage switches have been discontinued. GE brand may be a replacement. 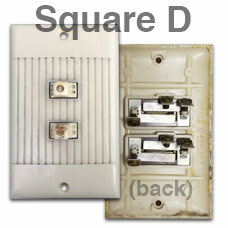 Please contact us if you have Square D switches that need to be replaced. 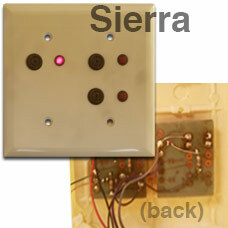 This is a Sierra low voltage cover with 2-wire switch buttons. The back of the plates are stamped with "The Sierra Line" and have a part number such as D-14. Buy replacement Sierra push button switch covers here. Douglas Lighting Controls were manufactured in Canada about 30 years ago and consist of momentary, 2-wire switches, relays and transformers. Parts have been discontinued for quite some time. You may have switches like the ones pictured here, as well as Douglas relays with the model #WR-6201 and Douglas transformers (model #WR-4075). 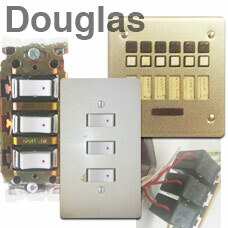 You should be able to replace your Douglas switches with Touch-Plate light switches. However if the relays or other parts are not working, you'll need to do a Touch Plate System Upgrade, which will use your existing wiring, but require updating wall switches and relays to modern Touch Plate low voltage parts. 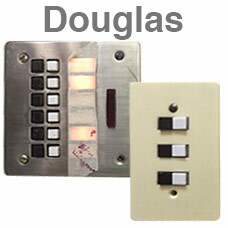 We can help get you set up with the components you need to transition from Douglas to Touch Plate. See replacement options for Douglas lighting here. 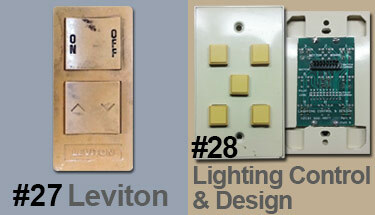 Here is an example of old Leviton brand low voltage light switches. 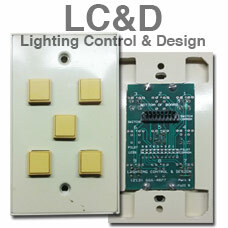 These are LC&D (Lighting Controls & Design) low voltage switches. Relays in this system may be Touch Plate brand, if the originals were ever replaced, as Touch Plate relays were incorporated into the system by LC&D years ago. Check relay part numbers on your relays to order the correct Touch Plate replacement relays. 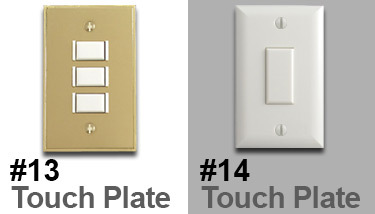 To replace any switches, you'll need to update to Touch Plate brand switches & cover plates. Shown here are parts in a Swepe system. Images were submitted by a customer with a mid-century U.S. home. This style of older Sierra switches are no longer available. Any replacements will require a complete update to a new GE LightSweep system. Please call us for assistance. 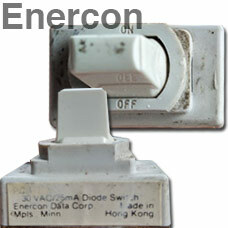 These diode light switches are part of Enercon Data Corp's wattage reduction line. They have 4 wires. Enercon marketed their energy system to business owners looking to reduce cost of facility operations. We've had customers unsuccessfully attempt to wire in GE pilot lights as replacements. We have no recommended replacement switches at this time. 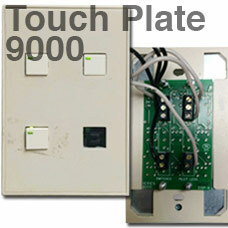 This older Touch Plate 9000 series is no longer available. 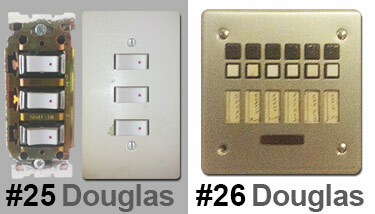 Any of Touch Plates's contact closure switches will work as replacements. 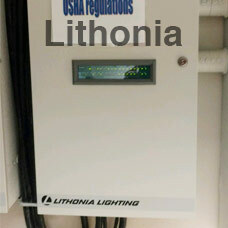 Touch Plate 9000 series switches may be connected to a Lithonia Lighting relay panel, like the one shown here. Identifying Low Voltage Systems - Which Type of Bracket or Strap Do You Have? If your low voltage switches are currently installed on a strap, bracket or mounting plate, then use this photo to determine which system type you have. Use the title and number designations to purchase the correct coordinating pieces. 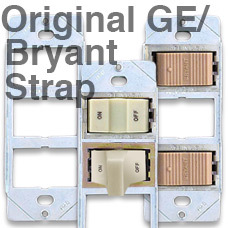 #1, #5, #7, #8 Original Style GE / Bryant: Switches sit in a narrow mounting strap that has three openings designed for one, two or three GE or Bryant switches. 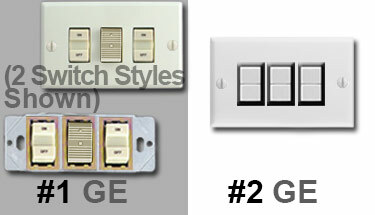 Click to buy compatible replacement original style GE & Bryant Switch Plates. #3 Bracket Mount: Switches clip into a diamond shaped mounting strap. The strap comes in one or two gang versions. The one gang version holds either one or two switches; the two gang version holds three or four switches. 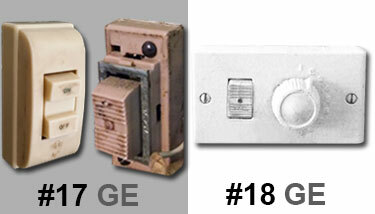 Click to buy GE Bracket Mount Light Switch Covers. #10 Remcon: Remcon switches are riveted directly into a metal mounting plate designed for either one, two or three switches. Remcon rocker switches have a curved or winged shape and rock from side to side or up and down depending upon the installation orientation. These parts are discontinued - for replacement information click Replacement Parts for Remcon Low Voltage Lighting. #12 Touch-Plate 5000 Series: Touchplate switches are riveted directly into a metal mounting plate designed for either one, two or three switches. 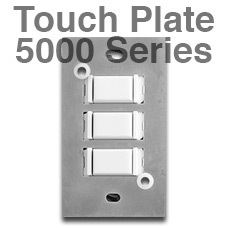 Click to buy Touch Plate 5000 Series parts. #15 Touch-Plate Classic Series: Touchplate switches are riveted directly into a metal mounting plate designed for either four or six switches. Click to buy Touch Plate Classic Series parts. 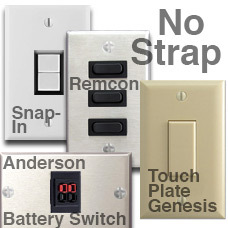 No Strap or Bracket: If your switches currently are mounted directly into a wall plate, then you may be using the #2 Snap-In, newer #10 Remcon, #14 Touch-Plate Genesis series wall plates and switches or Anderson Battery Switch. 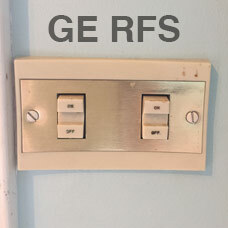 The original style switches are no longer manufactured by GE or Remcon. If you need to buy switches to finish your remodeling project, then you will need to buy newer style switches and the wall plates that fit them. 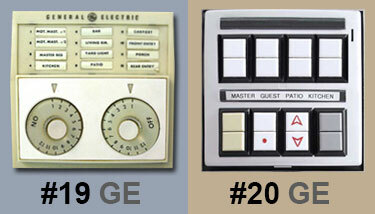 GE Style Light Switches: The older style GE rocker or push-button switches are no longer manufactured. One example of the old style is in the upper left of the photo. Other styles have ridged surfaces, a dot on one side or are lighted. These switches were often used in Bryant solenoid systems as well and can be fully interchanged within both systems. To the right is the currently manufactured pushbutton switch. These newer switches are available in lighted (locator), pilot light, raise & lower versions. 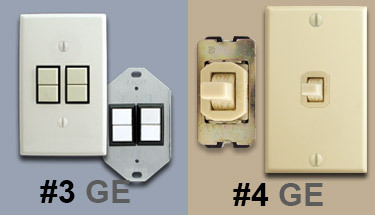 See the Old vs. New GE Low Voltage Light Switch Comparison Chart to help you find the correct replacement for any vintage GE low volt switch. 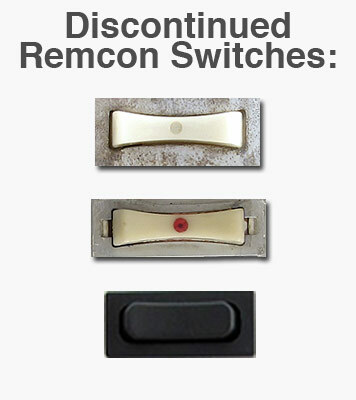 Remcon Style Light Switches: The older style Remcon rocker switches are no longer manufactured. One example of the old style is in the bottom left of the photo where two of them are secured in a bracket. These curvy switches have a dot in the center. The newer switches are available in black only. Can New GE Switches Be Used in Old GE Straps? In the photo at left, we have installed both an Old GE Switch and a New GE Switch in the original style mounting straps or yokes. While the current GE devices can, with a bit of effort, be jammed into the old straps, they are thicker (protrude more) than the old switches. As a result the switch plate will not mount flush with the wall and will stick out about an 1/8" revealing your cut plaster. If you have any doubts about how these will work, then use the #2 Snap-In style plates with the new low-voltage GE switches. Get tips for troubleshooting your GE low volt system.